Prospective living kidney donors need meticulous evaluation prior to kidney donation. Ambulatory blood pressure monitoring (ABPM) is considered the reference standard for diagnosing hypertension. With no prior study available in India in this context, we undertook this study to evaluate the utility of ABPM in kidney donors and effect of donor nephrectomy on renal function. This was a prospective observational study involving healthy prospective kidney donors between 18 and 70 years with normal office blood pressure measurements (OBPM). Detailed clinical and biochemical parameters were recorded. OBPM and 24-hour ABPM was done preoperatively and 3 months following donor nephrectomy. There were 51 donors with a mean age of 46.1 ± 11.3 years, of which 40 (78.4%) were females. Preoperatively, three (5.8%) donors were hypertensive on ABPM but normal on OBPM (P = 0.08). Three months post nephrectomy, hypertension was present in seven (13.7%) donors by ABPM, while only two (3.9%) donors were diagnosed as hypertensive by OBPM (P = 0.02). Median pre-nephrectomy proteinuria was 70 mg (10 mg–180 mg) with a mean estimated glomerular filtration rate (eGFR) using the Modification of Diet in Renal Disease (MDRD) formula of 86.86 ± 19.1 ml/min. Six donors developed >300 mg/day proteinuria, and 17 (33.3%) had a 24-hour urinary protein excretion greater than 150 mg/day. Mean serum creatinine (0.79 ± 0.11 vs 1.03 ± 0.16 mg/dl) significantly increased post donation, more so in donors >55 years of age (1.14 ± 0.25 mg/dl). Our study shows that in transplant donors, ABPM is better for diagnosing hypertension, which otherwise remains masked in 10% of the donors on routine OBPM. Significance of post-nephrectomy hypertension and increasing proteinuria needs further evaluation. Renal transplantation (RT) is the preferred treatment for end-stage renal disease (ESRD). Though deceased donor transplant offers the benefit of avoiding live donor nephrectomy, better outcomes with living-related RT (LRRT) combined with shortage of deceased donors makes LRRT the common and favored transplant option in India. Though the benefits of LRRT are unequivocal, the potential risks for the living donor have been a subject of concern worldwide. Live kidney donors are selected after extensive work-up to ensure that they are healthy and do not have additional risk of long-term complications. Donor follow-up studies have reported variable outcomes with regard to post-donation renal impairment, in part, due to inconsistent end-points, assessment, and follow-up methodologies. Predictors of a post-donation renal dysfunction (eGFR <60 ml/min/m2) include age >50 years, hypertension, and proteinuria at the time of donation. The long-term risk for hypertension in the kidney donor remains uncertain. Moreover, the risk of subclinical hypertension which is higher in donors is often missed by routine blood pressure measurement. Ambulatory blood pressure monitoring (ABPM) is a significantly better predictor of cardiovascular (CV) and cerebrovascular events than office blood pressure (BP) measurements and correlates with end-organ damage including left ventricular (LV) hypertrophy, proteinuria, and impaired arterial dispensability and compliance. In addition, ABPM also can diagnose white coat hypertension, white coat effect, masked hypertension, night dipper pattern, or night reverse pattern of hypertension. Studies on the utility of ABPM in transplant donors are lacking in India. The present study was designed to determine the effects of donor nephrectomy on BP, as measured by ABPM and renal function. The role of ABPM in the diagnosis of hypertension in kidney donors in comparison to office blood pressure measurement (OBPM) measurement was also evaluated. The present study is a prospective observational study conducted in the Department of Nephrology of our institute. Sample size: A total of 51 consecutive healthy living kidney donors were included in the study. A detailed history including any history of prior illness, past history, as well as personal and drug history was taken, and detailed general and systemic examination was done. All biochemical parameters were recorded. Blood pressure was measured by office and ABPM recordings as per the methods outlined below in all subjects. Renal function was measured by diethylenetriaminepentaacetic acid (DTPA) measured glomerular filtration rate (mGFR) and estimated glomerular filtration rate (eGFR), as derived from MDRD equation and CG formula before donation and 3 months after nephrectomy. Twenty-four hour urine protein was measured by Pyrogallon red method before surgery and 3 months after nephrectomy. Echocardiography was performed by cardiologist, pre-nephrectomy and 3 months post-nephrectomy. Well-controlled hypertension: Global mean ABPM of <130/85 mmHg in a patient on therapy. Refractory hypertension: Poorly controlled hypertension even with ≥3 antihypertensive drugs, including a diuretic. Dipper circadian profile pressure: Global mean for nocturnal BP of ≥10% lower than the global mean of diurnal BP. Nondipper circadian profile pressure: Nocturnal BP of ≤10% lower than the global mean of diurnal BP. Reverse circadian profile pressure: Global mean of nocturnal BP higher than the global mean of diurnal BP. White coat hypertension: Mean of three measurements in the clinic >140/90 mmHg in a patient with normal ABPM (<135/85 mmHg). White coat phenomenon: Mean of three measurements in the clinic of ≥140/90 mmHg, but with “well-controlled hypertension” by ABPM. Masked hypertension: Mean of three measurements in the clinic of <140/90 mmHg, but ≥130/80 mmHg by 24-h ABPM. Donors were followed up 3 months after donor nephrectomy, and repeat measurements of clinical and biochemical parameters, OBPM, ABPM, and echocardiography were done. Data was analyzed by Stata 11.2 (StataCorp. 2009. Stata Statistical Software: Release 11. College Station, TX: StataCorp LP. ), and appropriate statistical tests were done for assessment. Agreement analysis was done to examine the agreement between two different methods of measurement, and Bland–Altman plot was plotted. P < 0.05 was taken as statistically significant. Ethical clearance was obtained from institutional ethics committee. The present study included 51 healthy donors with a mean age of 46.1 ± 11.3 years. There were 11 males with a mean age of 47.2 ± 15.7 years, and 40 females with a mean age of 45.7 ± 9.9 years. Mean body mass index (BMI) was 23.25 ± 3.53 kg/m2 at the baseline and 23.95 ± 3.21 kg/m2 at the follow-up. Compared to predonation status, serum creatinine, potassium, uric acid, cholesterol, and fasting blood glucose were significantly altered post kidney donation, as seen in [Table 1]. Donors over 55 years of age had significantly increased creatinine values post donation (0.82 ± 0.11 mg/dl to 1.14 ± 0.25 mg/dl; P = 0.0002)). Two male donors, over 60 years of age, developed significantly high serum creatinine at follow-up, one from 0.95 to 1.4 and another from 1.0 to 1.6 mg%, respectively. The median 24-h urinary protein was 70 mg (10–180 mg) at the baseline and 117 mg (20–665 mg) at the follow-up. The difference was statistically significant (P < 0.0001). Six donors developed >300 mg/day proteinuria 3 months after nephrectomy. The mean mGFR was 93.06 ± 16.6 ml/min per 1.73 m2 before donation. Both MDRD and CG equations underestimated GFR at the baseline when compared to mGFR. The eGFR was below the cutoff for donation at the baseline (70 ml/min per 1.73 m2) in five donors by MDRD and in ten donors by CG/BSA equation. There was statistically significant reduction in eGFR after donation [Table 1]. Comparison between eGFR values at the baseline obtained by MDRD and CG equations in comparison to mGFR by DTPA values by Bland–Altman analysis revealed poor agreement between these methods [Figure 1]. The comparison between eGFR from various equations to mGFR by DTPA is tabulated below [Table 2]. 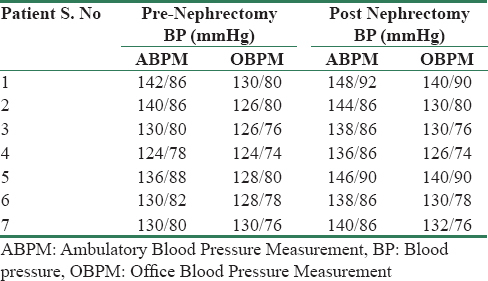 The profile of variation in BP between office and by ABPM during predonation and 3 months after nephrectomy is given in [Table 3]. The difference between the two readings was not statistically significant. Three normotensive donors by office BP were categorized as hypertensive on ABPM before nephrectomy. Seven donors developed hypertension by ABPM while two donors were hypertensive by OBPM at follow-up [Table 4]. Three donors, who were hypertensive on ABPM pre-nephrectomy, remained hypertensive on ABPM even after kidney donation. Both the patients who were hypertensive on OBPM were hypertensive on ABPM prenephrectomy. The difference in detecting hypertension, using ABPM in comparison to OBPM was statistically significant (P = 0.02). With regard to pre-donation “dipper” status, 12 donors were “non-dippers” and 13 were “non-dippers” 3 months after kidney donation. 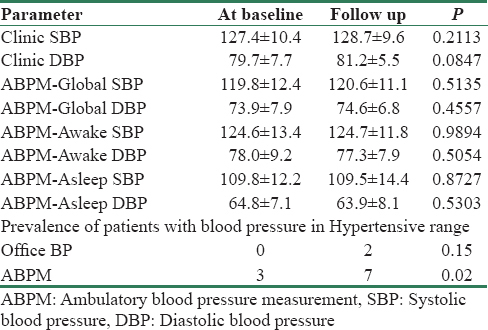 Agreement analysis between ABPM and OBPM revealed fair agreement between these methods for the diagnosis of hypertension, as shown in [Table 5] and [Figure 1]. Echocardiographic evaluation of donors revealed decrease in ejection fraction post donation (61.7 ± 1.9% vs 60.8 ± 2.3%), though the absolute decrease was less. Moreover, interventricular septal and posterior wall thickness did not differ significantly after donation. Living kidney donation is practiced with the expectation that the risk for short-term and long-term harm for the donor is outweighed by the psychological benefits of altruism and improved recipient health. Hypertension is a significant risk factor for adverse outcomes, and whether measurement of blood pressure by ABPM improves the predictability of donor outcomes is an unanswered question that needs well-conducted clinical studies. The mean age of our donors is similar to other studies from our subcontinent. The female preponderance (80%) of donors is due to the social status prevalent in our country. Donor nephrectomy results in a sudden loss of approximately 50% of nephron mass with an immediate decrease in GFR; however, the remaining contralateral healthy kidney has the ability to recover a significant percentage of lost function within a relatively short period of time. Our study showed that there was a statistically significant increase in blood urea and serum creatinine 3 months after nephrectomy. Two male donors over 60 years of age developed significantly high serum creatinine values at follow-up. This signifies that the total recovery of renal function does not occur by 3 months and may take longer in those with detrimental factors such as old age. In the present study, eGFR by MDRD and CG formulae had a poor correlation with mGFR in healthy donors. These formulae were computed in a different population and cannot be extrapolated to Indian donors. The study by Tent et al. evaluating the utility of the three equations, namely, MDRD, CKD-EPI, and CG in comparison with DTPA concluded that these three equations are less reliable tools for evaluation of living kidney donors. It is clear from our study that we cannot substitute DTPA mGFR with either MDRD or CG GFR for donor screening purposes, eGFR should be interpreted with great caution, and when in doubt, measured GFR (by DTPA) should be performed to prevent unjustified rejection of prospective kidney donors. Proteinuria is present in approximately 20% of donors after kidney donation, which has been seen in long-term studies. This occurs due to a combination of hyperfiltration damage and coexisting comorbidities. In the study involving 70 living kidney donors from Cleveland Clinic, there were 13 (19%) patient who had a 24-h urinary protein excretion greater than 0.15 g/day. We found that there were 17 (33%) subjects, who had a 24-h urinary protein excretion greater than 0.15 g/day, more so with donors in the older age group (>55 years). The post-donation proteinuria was significantly higher in elderly donors, 160 (73-665) mg/dl when compared to younger donors, 108 mg/dl (20–360) (P = 0.04)). However, Kasiske et al. found that neither urine total protein nor urine albumin was affected by donation at 6 months of follow-up, and Bieniasz et al. observed microalbuminuria in only two patients (5.4%) and no cases of proteinuria were observed., Data from the Swiss Organ Living Donor Health registry concluded that hypertension is the main driver for microalbuminuria post-donation. Whether the values would have been different in our study had microalbuminuria been assessed needs confirmation. Nevertheless, the increase in proteinuria among donors, especially elderly donors, as early as 3 months post-donation is a signal for clinicians to monitor proteinuria more robustly in this group. Currently, kidney donors are evaluated by office BP measurements. The prevalence of hypertension post-donation varies widely from 9 to 48% in different studies., ABPM has been shown to be more closely related with markers of cardiovascular disease., However, data on ABPM in kidney donors is lacking. By performing ABPM in our study, we could identify three donors who would otherwise be classified as normal by OBPM pre-donation. Moreover, seven donors were hypertensive by ABPM post-donation as against two by OBPM. In the study by Özdemir et al. involving 126 donors, of the 89 patients who were normotensive, six were detected to be hypertensive by ABPM. In the 37 patients with borderline BPs, 24 had hypertension diagnosed by ABPM. On the basis of the limited studies conducted to date, kidney donors may have a 5 mm Hg increase in BP within 5 to 10 years post-donation over that anticipated with normal aging. In the Swiss Organ Living Donor Health registry, the risk of hypertension increased by 3.64 (95% confidence interval, 3.52–3.76) after 1 year of kidney donation. In our study we have shown that the increase starts as early as 3 months post-donation. The increase in OBPM post-donation, though not statistically significant, indicates a worrisome increasing trend. In addition, only those subjects who had hypertension by ABPM pre-nephrectomy developed hypertension (by OBPM) at 3 months post-nephrectomy. Siebels et al. using ABPM reported that 7% of the elderly donors (>60 years) were hypertensive and required therapy. Prasad et al. studied the change in BP by ABPM pre-donation and 6 months post-donation, and found that the difference in BP was not statistically significant. In the study on 148 living donors by Textor et al., awake ABPM did not change significantly between pre-donation and 6 months post-donation. The opposite is also true that those with “white-coat” hypertension can be cleared for surgery with normal values in ABPM, as shown in the study by Ommen et al., wherein 62% of the 63 donors evaluated had “white-coat” hypertension and were subsequently cleared for kidney donation after ABPM. This would help us to avoid loss of donors from the already reduced donor pool. Ten year follow-up of 28 donors revealed similar BP profile in the study by Yalin et al. Considering that in a small cohort of 51 donors, ABPM could show a significant difference in diagnosing hypertension, the utility of ABPM in the routine monitoring of donors needs to be established as the care of donors is of utmost importance. It needs to be noted that only those donors with hypertension by ABPM developed early hypertension (by OBPM) post-donation. Hence, they are at an increased risk for adverse outcomes, necessitating frequent follow-up visits and detailed evaluation. The strength of our study lies in the detailed evaluation of voluntary kidney donors, pre and post-donation with thorough assessment of BP by both OBPM and ABPM. However, the results are underpowered due to the small population size. Moreover, the duration of follow-up has to be increased to ensure that the hard cardiovascular outcomes can be assessed with certainty. The results, however, being the first in the Indian population needs to be kept in mind while evaluating donors in the Indian subcontinent. In conclusion, our study shows that the use of ABPM helps to identify donors with “masked” hypertension. The presence of proteinuria and renal dysfunction in a subset of donors as early as 3 months needs further evaluation. Srivastava A, Mani A. Deceased organ donation and transplantation in India: Promises and challenges. Neurol India 2018;66:316-22. Abramowicz D, Cochat P, Claas FHJ, Heemann U, Pascual J, Dudley C, et al. European renal best practice guideline on kidney donor and recipient evaluation and perioperative care. Nephrol Dial Transplant 2015;30:1790-7. Lee JH, Kim SC, Han DJ, Chang JW, Yang WS, Park SK, et al. 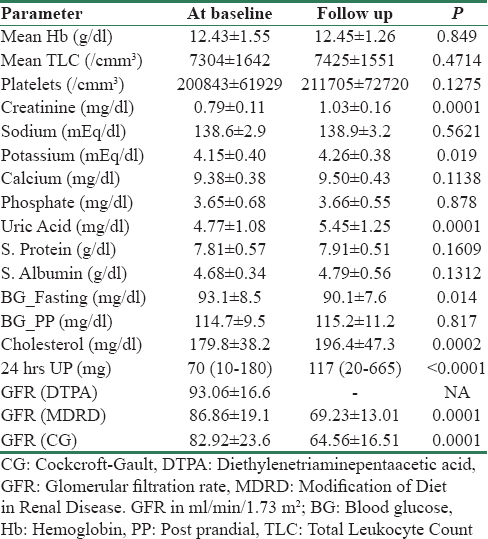 Risk factors for MDRD-GFR of less than 60 mL/min per 1.73 m2 in former kidney donors. Nephrology (Carlton) 2007;12:600-6. Boudville N, Prasad GVR, Knoll G, Muirhead N, Thiessen-Philbrook H, Yang RC, et al. Meta-analysis: Risk for hypertension in living kidney donors. Ann Intern Med 2006;145:185-96. Lewington S, Clarke R, Qizilbash N, Peto R, Collins R, Prospective Studies Collaboration. Age-specific relevance of usual blood pressure to vascular mortality: A meta-analysis of individual data for one million adults in 61 prospective studies. Lancet 2002;360:1903-13. Grossman E. Ambulatory blood pressure monitoring in the diagnosis and management of hypertension. Diabetes Care 2013;36(Suppl 2):S307-11. Verdecchia P, Angeli F, Gattobigio R. Clinical usefulness of ambulatory blood pressure monitoring. J Am Soc Nephrol 2004;15(1 Suppl):S30-3. O'Brien E, Parati G, Stergiou G. Ambulatory blood pressure measurement: What is the international consensus? Hypertension 2013;62:988-94. Levey AS, Inker LA. GFR evaluation in living kidney donor candidates. J Am Soc Nephrol 2017;28:1062-71. Bieniasz M, Domagala P, Kwiatkowski A, Gozdowska J, Krzysztof O, Kieszek RA, et al. The assessment of residual kidney function after living donor nephrectomy. Transplant Proc 2009;41:91-2. Rowinski W, Chmura A, Włodarczyk Z, Ostrowski M, Rutkowski B, Domagała P, et al. Are we taking proper care of living donors? A follow-up study of living kidney donors in Poland and further management proposal. Transplant Proc 2009;41:79-81. Dols LFC, Kok NFM, Roodnat JI, Tran TCK, Terkivatan T, Zuidema WC, et al. Living kidney donors: Impact of age on long-term safety. Am J Transplant 2011;11:737-42. Hourmant M, Lerat L, Karam G. Donation from old living donors: How safe is it? Nephrol Dial Transplant 2013;28:2010-4. Tent H, Rook M, Stevens LA, van Son WJ, van Pelt LJ, Hofker HS, et al. Renal function equations before and after living kidney donation: A within-individual comparison of performance at different levels of renal function. Clin J Am Soc Nephrol 2010;5:1960-8. Goldfarb DA, Matin SF, Braun WE, Schreiber MJ, Mastroianni B, Papajcik D, et al. Renal outcome 25 years after donor nephrectomy. J Urol 2001;166:2043-7. Kasiske BL, Anderson-Haag T, Israni AK, Kalil RS, Kimmel PL, Kraus ES, et al. A prospective controlled study of living kidney donors: Three-year follow-up. Am J Kidney Dis 2015;66:114-24. Thiel GT, Nolte C, Tsinalis D, Steiger J, Bachmann LM. Investigating kidney donation as a risk factor for hypertension and microalbuminuria: Findings from the Swiss prospective follow-up of living kidney donors. BMJ Open 2016;6:e010869. Lentine KL, Patel A. Risks and outcomes of living donation. Adv Chronic Kidney Dis 2012;19:220-8. Ierino F, Boudville N, Kanellis J, CARI. The CARI guidelines. Donors at risk: Hypertension. Nephrology (Carlton) 2010;15(Suppl 1):S114-20. Özdemir FN, Güz G, Sezer S, Arat Z, Haberal M. Ambulatory blood pressure monitoring in potential renal transplant donors. Nephrol Dial Transplant. 2000;15:1038-40. Siebels M, Theodorakis J, Schmeller N, Corvin S, Mistry-Burchardi N, Hillebrand G, et al. Risks and complications in 160 living kidney donors who underwent nephroureterectomy. Nephrol Dial Transplant 2003;18:2648-54. Prasad GVR, Lipszyc D, Huang M, Nash MM, Rapi L. A prospective observational study of changes in renal function and cardiovascular risk following living kidney donation. Transplantation 2008;86:1315-8. Textor SC, Taler SJ, Driscoll N, Larson TS, Gloor J, Griffin M, et al. Blood pressure and renal function after kidney donation from hypertensive living donors. Transplantation 2004;78:276-82. Ommen ES, Schröppel B, Kim J-Y, Gaspard G, Akalin E, de Boccardo G, et al. Routine use of ambulatory blood pressure monitoring in potential living kidney donors. Clin J Am Soc Nephrol 2007;2:1030-6. Yalin SF, Trabulus S, Seyahi N, Cengiz M, Cicik ME, Altiparmak MR. Ambulatory blood pressure monitoring in living kidney donors: What changes in 10 years? Clin Transplant 2018;32:e13224.